RLS Wacon offers numerous direction indicators and traffic lights in various colours and dimensions for the installation in round or square columns, sockets or balustrades. 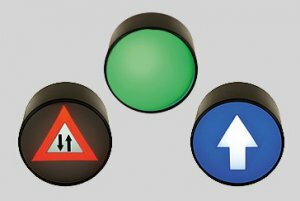 Whether you require directions arrows, one way- or alternating directions symbols, animated direction indicators or multi-purpose traffic lights – RLS Wacon offers them all, site-made in Germany. Our animated direction indicators allow a particularly high-quality and individual indication of the availability of your escalator for its user. With the multi-purpose traffic light, RLS Wacon offers you a product which allows you to visualize individual sequences. The multi-purpose traffic light can be adapted to many different installation situations. The animated direction indicator ELPB192 combines directional arrow and stop symbol in one product. The ELPB192 is intended for installation in the base plate of an escalator or in a square column. The direction indicators of this category are used in square columns or sockets with a 75 mm cut-out. Their straight front pane is interchangeable. For the installation in balustrades with a cut-out of 75 mm, we offer directional arrows, one-way street- and changeover symbols as well as red / green switchable signal lamps with domed front pane. The red / green switchable traffic lights with domed front pane are suitable for installation in balustrades with a 70 mm recess. The direction indicators for round columns with a diameter of 114 mm have a curved front pane for installation in a 70 mm recess. They are available with and without function monitoring. The red / green switchable bi-color traffic lights with straight front pane are installed in square columns or base plates with 60 mm recess. For installation in balustrades with 60 mm recess, symbols are available in various versions, with and without function monitoring. The yellow fault indicator with straight, interchangeable front pane is suitable for installation in square columns or sockets with 35 mm recess. The direction indicators of this category are used in square columns or sockets with a 70 mm cut-out. Their straight front pane is interchangeable. For further information please see our catalogue. Appropriate for the escalator and the traffic light used, we offer four different mounting sets. Each set is designed for the attachment of one traffic light.